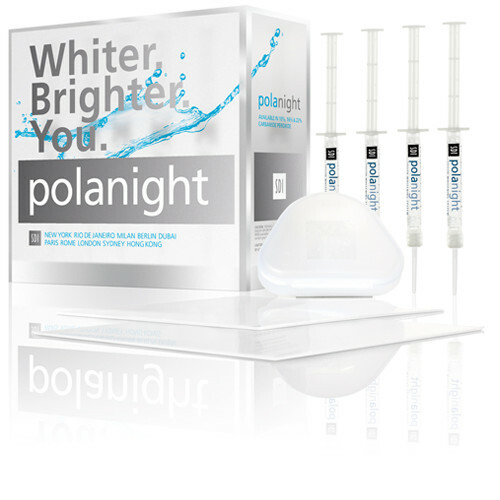 Pola night is used as a take home whitening system. It is spearmint flavoured crystal clear gel that contains a unique blend of soothers, conditioners and water to whiten your teeth fast with great results and minimal sensitivity. The gel is applied to custom trays (similar to a mouth guard), that you wear when you want to: at night or any time of the day. Your dental professional will recommend the exact product to suit your teeth and lifestyle. tray for the teeth undergoing treatment. Wipe away excess gel in mouth with a tissue or dry soft brush..
immediately after treatment – wait for at least two hours.